in measuring efficiency in language education. but an engineer by education. Though, an engineer with a deep love for learning languages. even though my brain is not really adapted to this. I'm definitely not the sort of talented polyglot. So that's why I went to this language education professor at the University. I wanted to know: what does scientific research say? Could he confirm all my ideas? our materials and programs in the right direction. but not all studies measure results well. are related to very specific situations. for this specific target group. even formulating the right question is actually a challenge. You start searching on the internet. and I thought, let's take that as a starting point. Let's go to my primary school. My story of learning a foreign language started at 10 years old. That was when we learned our first English words at school. but not when I was young. and one year later German. are what we all learned at school in the Netherlands. As a small country, you need to be internationally orientated. and you will have more contact with people from other countries. language education is a main part of the school system. And that brings me to the first question I would like to investigate. Is language education also better in these small European countries? to see if anything is specific about the way languages are taught here. How can we identify how well people speak foreign languages? Let's see how well we speak the language we almost all learned. This is the EF English Proficiency Index. Netherlands is ranked first, followed by Sweden, Denmark and Norway. although Germany (not small) is also doing well of course. But the bigger countries Spain, France and Italy are ranked much lower. and so English is easier to learn. than the Slavic languages, Finnish, and Hungarian. probably we – the small European countries – are doing something well. then about 70% of the Dutch population have mastered English at B2 level, or higher. because it is about measuring proficiency as a foreign language. to a level that we can call proficient. that in Great Britain it is not really much different. Who are the market leaders in self-study methods for learning languages? The market leaders in commercial language programs are these two. And this as a free resource. from the United States of America! Maybe you remember that commercial from the nineties. The abdominizer was a piece of plastic, that you could use for your workouts. I don't know these programs very well. They differ SIGNIFICANTLY from the books that we had in school. And actually from how languages in small European countries are taught. How did we, the small European countries, not know this? Why aren't we learning a language like a child? that I found myself on the internet. They call this the 'critical period hypothesis'. and after that, you will learn a language much more slowly. The so called 'frozen brain hypothesis'. A lot of people believe that children learn a language faster. But this is an absolute myth. as a mother tongue when you are a child. ou cannot learn a language anymore as a mother tongue. And to some extent that counts for pronunciation as well. to copy what you hear around you. that adults are much better and faster at learning a second language than children. children perform more poorly than adolescents and adults. A study by Snow & Hoefnagel of migrants showed the same results. proved that 11-year old children learn faster than 8-year old children. and Danish children learning English. debunking the myth that the earlier you start learning languages the better. and then you always see the same thing. After a while the children speak the language and the parents don't. and from that moment they have fulltime exposure to the foreign language. Usually that doesn't apply to the parents. Secondly: for the children there is a real incentive to learn the language. you simply need to survive. There is no alternative of switching to English. the children are more or less fluent in the foreign language. and for a very long time. because ADULTS can learn a language faster. asking if I had a 1-year full time course. and we believe that we can learn a language fast. Of course, if you use the abdominizer every day, it is better than doing nothing. But is this the most efficient way? so I am not talking about using it as an additional source for learning. Let's go back again to my secondary school! not in the language we were learning. The grammar was also used in the text, and then there were the exercises. listening, reading and doing exercises. Many different aspects of language learning combined. I just did not understand anything. I became the champion of the Netherlands at playing bridge. It is a card game, that you win not with luck, but with your brains. In Holland, we even call it a sport. including the European and World Championships. and meeting people from other countries. to activate the passive knowledge of all those years of learning theory. The same happened with French. Our school organised an exchange with a French school (after 4 years of French language classes). I lived for 1 week with a French family. On day 1 couldn't say a word. And more importantly I did not understand a word. The passive knowledge was activated. And I could use what I had learned. And the same happened with German. a local branch near the coast that had developed a sideline of renting out holiday homes. and giving the 'schluessel' to people who arrived at their holiday homes. and then it suddenly all happens and you start using it. You activate passive knowledge, and you start to apply it. we had to choose our subjects for the last 2 years of school... for the final exam. but then in the last phase you choose your own combi-pack. You have obligatory subjects like English, Dutch and Mathematics and optional subjects. In my case I had to choose at least 4 optional subjects. and that meant that you could not choose just any combination of subjects. and on the other hand the science subjects: physics, chemistry and biology. So you could only choose 1 type of subject. But I insisted that I wanted to do my final exam in German AND biology. then at least give me the opportunity to do the exam. I considered that it was my right! but I could study German by myself from the book. and actually my grades were not so bad. One part of the final exam was an oral examination. dealing with German clients at the bank. of the pupils in your class. And I felt that I could learn a language on my own. If I can learn a language from a book, then I can learn whichever language I want! which seemed to me very strong and direct. Why not learn that language? And so I bought a self-study book for learning Russian. And I just started on page 1. I got a job at a parking spot near the beach. close the barrier, putting the sign 'VOL' and then again I had nothing to do. A different ending which you can hardly hear. I took the dictionary, and I marked every word that I wanted to remember. Every word from A to Z.
that I printed out in a way that I could fold the paper. Nowadays we have apps which serve the same purpose. But that was my kind of system. With that knowledge I went to Russia for the first time. and I couldn't get a word out of my mouth when speaking with Russians. And OK, I had already found out that my pronunciation was totally wrong. I had learned it from a book. when you've studied other foreign languages. You know, you just make those strange moves with your mouth and don't feel embarrassed. I just said: "Hi, I am in a very good mood." But that was not the biggest issue. Not on day 5, not on day 10 and not after 3 months, when I left Russia. Why did it happen with English, when I started to take part in international bridge tournaments? Why did it happen with German, when I started to work at the bank with German tourists? Why did it happen with French, when we had the exchange with the French school? And why it did NOT happen now? I thought grammar was boring, and not important. I thought I could manage with only words. But there was something I did not realise. is different with the function of the word. And it's not only the ending, but also the vowels and the stress on syllables that change. 'Home' in ' I am at home' = [DO-ma]. 'Home' in 'I go home' = [da-MOI]. [da-ra-GOI] = expensive as an adjective of a masculine noun. And [DO-ra-ga], should not be confused with [da-RO-ga] which means: road. I came to the country with a lot of passive theoretical knowledge including grammar. And it was just a matter pushing the 'activation' button..
Total immersion, when you already have it all in your head, is what works. It will put things in the right place. You will start to apply what you have learned before. Which is in itself a challenge. But when it's not there it will not come. I finally understood the success of the way languages are taught in school. A balance of everything including grammar, followed by a lot of practice. After my first 3 months in Russia, on my last day, I bought a Russian grammar book. I took it with me back to the Netherlands. But now I had the incentive. This was what I had missed. and then I went back to Russia one year later. We're now talking about the period when the internet started to develop. On the chat-program ICQ I found a girl. Now I started to speak and understand Russian. Now it happened, what happened before with the other languages. that I had managed to learn this exotic, and very difficult language by myself. because that is what those programs lack. Then I started to practise my Spanish. this time came much more quicker. where the emphasis on grammar is traditionally much higher than in the rest of the world. why adolescents and adults learn a language faster than children. Because they have a broader understanding of grammar. 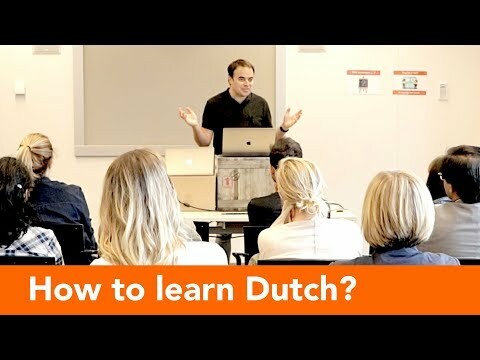 Why are you at the Dutch Summer School? What is different, being here as an adult, compared to being in school as a child? I have to come up with some mnemonic! Incentive: as an adult you have an incentive. Most adults are learning a language because now they really need it. I really had no idea if I would ever speak it with someone. You paid money for this course, that's always a good motivation. Focus: as an adult you can push yourself to the limit. Two weeks, four weeks, six weeks doing an intensive course. 100% focus for the best possible result if you make learning the language a priority. mainly one directional with a teacher explaining something to the children. so that we can speak more in class. If the process itself is fun, you're more likely to continue learning. and allowing only nice people into our lessons. THEN you will speak Dutch soon! I've told you my personal story and how I came to these ideas. and practising a lot on the other side. but I believe really that you can learn quite a lot by yourself.